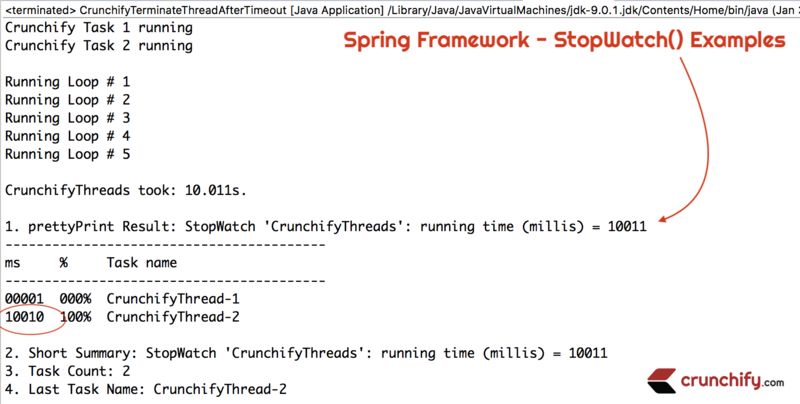 Spring Framework – StopWatch() is a very handy utility for any Java developer if you have small Java application or production ready application. Most of the Java applications involve Thread pooling or multiple simultaneous job invocation at the same time. Then you are at right place. In this tutorial we will go over steps on how to measure and report time taken by each and every thread or Java Methods. StopWatch is a simple stop watch, allowing for timing of a number of tasks, exposing total running time and running time for each named task. You need Spring MVC core Maven dependency to get this program run. Please add above maven dependency to your Maven Project and follow below steps. We are using all below operations on StopWatch to print different results. Kindly take a look at code for more detailed description. // Return a short description of the total running time. // Return the number of tasks timed. // Return the name of this task. Just run above program as a Java in your Eclipse environment or stand alone using Terminal or Windows DOS and you will see performTask2() method take 10 seconds as we have for loop with count 5 and 2 seconds Thread timeout. Let me know what you think of StopWatch. I personally use SpringFramework’s StopWatch in all of my applications.